If organizations possess an ethics code, would make sense developing organizational leaders? Leadership development in organizations has been and will no doubt controversial. There are many theories that say that a leader is born, but also done. If this theory is correct, then we should distinguish two types of constructions. Build a leader would be one thing, and build leadership would be another. Building leadership may require some unorthodox ingredients such as political marketing strategies. 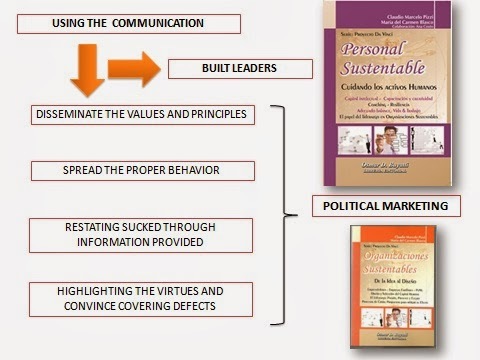 The political marketing is not just a tool used to compete for public office, is also an element used in organizations by executives and managers. Marketing designed to influence consumers about political issues, particular candidates for public office, or public issues. Although political marketing uses many of the same techniques that other forms of marketing do, it is actually used to promote a concept or an idea, rather than a specific product or service, and to motivate people to vote for that idea. Barron’s marketing dictionary. Building leadership is very different from building a leader. A leader is = code of ethics (1) set of values (2) ability to influence (3) + transformation capacity (4). A positive leader is = 1 +2 +3 +4 + clear vision oriented to common good. what is a leader without a code of ethics or a body of values? Is only the referent of a group (circumstantial reference accessions generated through its ability to influence) A manipulator, not a leader. We could say then that building leadership undoubtedly needs communication as a tool for dissemination and as an element to convince groups. If we follow this theory, once built the leadership, we can obtain an artificial leader. So, leader should be the representation of all the elements mentioned on the slide, finally, this is the result of the actions taken. This is a building process where ethics simply does not exist. However, leadership is defined as a set of skills that an individual has to influence the lifestyle of people. Linked with a working group is defined as the ability of an individual to manage, motivate, develop a group. When we link the leadership concept to the organizational aspect, we say that leadership is linked to a business purpose and the exercise of a management activity. Leadership is one , ie , that there are not several leaders, definition does not change, only change the leadership style, the influence to others , which is closely linked to personal characteristics of each individual, which in turn is related to the training and learning. When we talk about organizational leaders, we are talking about building their characteristics, values, principles and rules necessaries to develop this role. It is said that an "organizational leader" can be built on base the necessary highlighting qualities. In his book “The Paradox," James Hunter talks about the values and characteristics. Kindnesses, love, patience,good treatment, are virtues that “a simple person would find in the other." The example here is important as a way to dial a difference among leaders and the path and phases used to build them. These values, principles and characteristics can be part of defects that should be solved on the person, the candidate to leader. If the answer to the organizational problems were building good values -based leadership, fairness and respect, the declaration and operation of an ethics code itself would eliminate the need for leaders. As mentioned early, there is a difference between managers and leaders. Bosses have authority by charges and ranges. Leaders have the authority provided by people, i.e., represent and stimulate a group based on the characteristics of that group. Group members wish be represented by them. What is an ethics code? Ethics relates to the moral, and the moral to the set of behaviors that represent what is good or bad, allowed and not allowed for a society. Therefore, an ethical code represents conducts, patterns of behavior that should lead people within the organization. This code applies to all members without exception. The attributes of any boss could be able to join to a leader's values and capabilities through the ethic codes. Both roles could be merged into one. A chief would only be required to maintain the kind of social behavior framed the ethic codes. So why do we need leaders if we can solve business issues by defining what is right and what is wrong. Why organizations need characters as Gandhi if everyone in the company would have to act as the Mahatma? A transactional leader is recognized by the members of his team because it provides the elements and resources considered valid for them. In short, this is a transaction in which one (the leader) generates positive behaviors for others (followers) with the hope that these others give more of them and fulfill the task in return. Under a traditional business or company, this is possible and expected. Transformational leadership operates on the scale of values, attitudes and beliefs of followers (with the objective of optimizing behaviors and generate new leaders). So then this kind of leaders, disagrees with established parameters, and sets up alternative proposals for change. This kind of leader use the charisma to excite and convince their followers, and even takes personal risks in the task. Ethics code shows us the way about what is and is not correct in the organization or even in the life, but you cannot dispense with leaders if it is to lead people to give the plus, do more than you usually do. Political marketing is as an analgesic, quiet the pain but eventually the symptoms appear and the image of the leaders artificially constructed could collapse dramatically. The charisma, the ability to influence, it's a capability despised or feared in organizations, is the driving force of change, is the power necessary to get the change through the leaders. Ethics code regulates the behaviors of all company members, but cannot by itself generate increased productivity, inventiveness, creativity they need sustainable organizations. Love and respect for employees is not generated from a code of ethics. Love and respect for employees, by it, is not sufficient to change the inertia of things in the organization. It takes the courage and spirit of transformational leadership to do it. If roughly the leader represents the sum of values, exemplary attitude and charisma, we can say that the code of ethics would help solve one aspect of leadership (what is and is not allowed in the organization) but not its genesis. Ethic codes guides the transformational leadership which nourish sustainable organizations to achieve immortality. From the moment we accept that people are not a part of the production process, but beings with flaws and virtues, personal projects, values, beliefs and unexplored capabilities, whether or not playing a work role, we accept being part of the world of complexity. In this sense, we must stop being conventional leaders to become "leaders of sustainability", to do this, we need to prepare not only in the realm of the technical, but also the mental and spiritual. From the book "Sustainable Personal - Caring for human assets" page 221 - From Davinci Project Series - Editorial Buyatti - Argentina. Seleccionar personas no es una tarea sencilla. 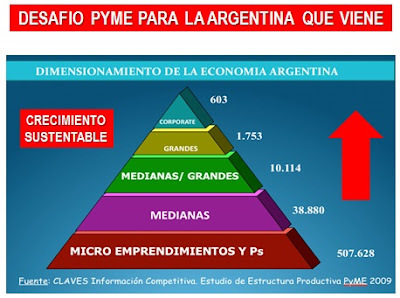 Requiere de un alto nivel de profesionalismo y fundamentalmente, “perspectiva”. A todo ello, para que la cosa salga bien, hay que sumarle una cuota de ética. El cocktail no es tan simple. Los métodos tradicionales de selección no aseguran eficiencia y efectividad a nivel resultados. Lamentablemente al igual que la educación, ha sido masificada para evitar “trabajo”. Parecería interesante abrir un debate serio sobre algunos aspectos del proceso. Aquí vemos algunos ejemplos y comentarios sobre la cantidad de páginas que debe llevar un CV, lo cual lleva a sacar ciertas conclusiones contrapuestas. ¿Si no existen “reglas”, entonces porque debe ser de 1 o dos páginas?, la respuesta es tiempo. ¿Si el tema es tiempo, porque resumir la información en el CV y amplificarla en linkedin?, ¿no se supone que la idea es leer menos? Cuando las personas se presentan a cubrir cargos públicos, el CV y los antencedentes que los postulantes deben llenar, exceden con amplitud las tradicionales dos hojas que se suele indicar para la actividad privada. La carga de trabajo disminuye al hacer un CV de dos hojas, pero luego vuelve a aumentar si para encontrar información del postulante debe ingresar en la web y seguir buscando. “En otro caso, el reclutador necesita sólo el resumen u observar la capacidad de síntesis y presentación del postulante. Por ello ciertas empresas de recursos humanos consideran que dos es el número máximo de páginas a presentar. En el caso peruano, la práctica de dos páginas parece no estar muy difundida y será necesario tener una estrategia de acuerdo al puesto o al reclutador. No todos los CV’s aplican a la misma búsqueda, por ello no tienen por qué ser iguales. Buscar un Director con 20 años de experiencia no es lo mismo que buscar un cadete con un año de antigüedad. Cuando se trabaja en selección de personal, la función primaria es “seleccionar”, por tal motivo, hay que trabajar. El problema del universo es atendible, pero el árbol no debe tapar el bosque. En la actualidad, existen muchas postulaciones a diferentes posiciones fruto de la movilidad y el desempleo. De la misma manera que un CV de 1 o 2 páginas puede acortar su lectura, de igual modo esta simplificación puede profundizar la tendencia a “eliminar” con mayor facilidad al postulante. El selector artesanal, busca información de detalle, observando cosas que puedan ser de importancia para que el fit sea el mejor posible. La masificación de la búsqueda impide este procedimiento. Es importante destacar que un CV altamente cargado de hojas no es buena prensa en “ciertos casos”, pero no es la simplificación de la búsqueda, la bandera que debe levantarse para aconsejarlo sino el criterio. Un selector no debe ahorrar tiempo en la búsqueda porque su función es buscar y encontrar una solución, “no tan solo para la empresa, sino también para la persona que busca empleo”. Hay elementos que no ayudan al propósito de buscar personal, y esto tiene que ver con el nivel de comunicación e información de las posiciones y fundamentalmente de los datos con los que el selector cuenta para realizar la búsqueda. No nos dan las cuentas, 25 -18 = 7. Una carrera de las denominadas largas, insume de 5 a 7 años aproximadamente. Si se debe contar con 4 años de experiencia, esto implicaría que el postulante debería haber comenzado a trabajar en los últimos años de la carrera para poder lograr su primer empleo y luego ingresar al “área estratégica de una empresa”. Estrategia es lo que en general no se practica en las organizaciones, y es materia de post grados, por lo cual parecería ser muy difícil encontrar un perfil que cumpla con la base del requisito, si a eso le añadimos inglés avanzado y paquete office, no así cuando trepamos en la edad. 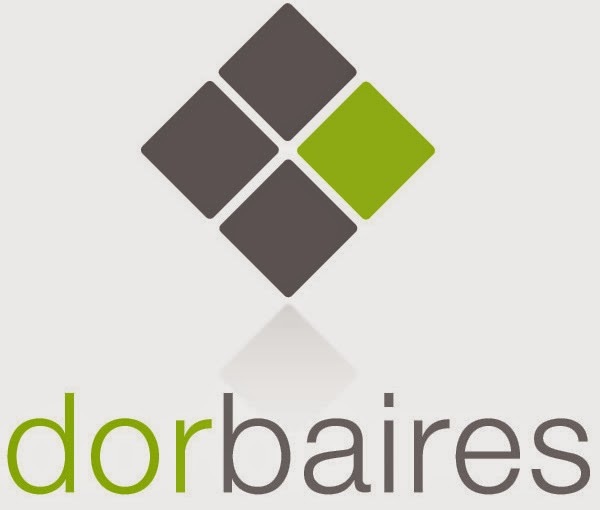 Muchas veces las consultoras se encuentran ante estas situaciones en donde deben acceder a pedidos sin demasiados datos, o a publicar avisos de posiciones preestablecidas por las empresas sin un grado razonable de evaluación. Un selector no puede cambiar el organigrama o la administración de su cliente. Se encuentra obligado a adaptarse. 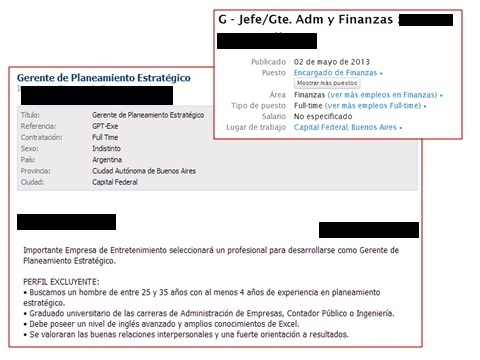 Jefe / Gerente, ¿da igual?, ¿son los mismos requisitos, el mismo señotrity, las mismas responsabilidades y la misma remuneración? Muchas veces se colocan títulos rimbombantes y grandilocuentes para llamar la atención de postulantes. Me pregunto si estos niveles gerenciales tienen suficientes potestades para manejar decisiones, si se les da la autoridad para manejar presupuestos o invertir fondos, etc. Cuando observo que gerentes de sucursales de bancos por ejemplo, deben preguntar a un nivel superior si están autorizados o no a cubrir un cheque por encima de un determinado límite de crédito,…., me pregunto que nivel de responsabilidades, facultades y proyecciones tiene una posición que debe cubrirse si se solicita de manera indistinta un candidato para una " gerencia o una jefatura". 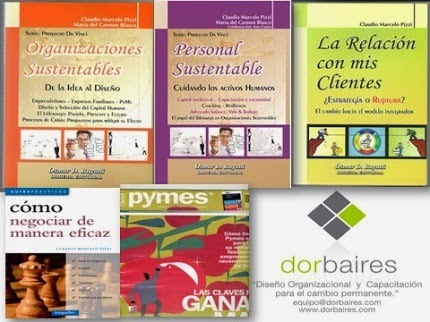 ¿Acaso las decisiones en dicha empresa son del mismo tipo?, ¿existirá alguna definición sobre conceptos tales como delegación, toma de decisiones, tipo de decisiones programadas, no programadas, etc.? Que significa "fuerte orientación a resultados", ¿acaso el resultado es el primer objetivo del puesto?, se supone que el resultado es la síntesis de un proceso, no es el proceso en si mismo. ¿No sería mas conveniente que el aviso describa, con que tipo de organización se encontrará el candidato?, sería importante que el mismo sepa en que tipo de ambiente deberá trabajar (colaborativo o competitivo), cuales son los valores y principios de la compañía, etc. En las organizaciones sustentables, no sería posible tratar la selección de personal de esta manera. El cuidado del capital humano es vital para toda empresa que desee perdurar en el tiempo. El diseño de puestos, la visión de cada puesto, la estrategia y sus trayectorias, el desarrollo de un plan son elementos centrales que deben ser acompañados de evaluaciones de puestos y de políticas claras. Una empresa tradicional se genera muchos inconvenientes al carecer de un adecuado plan estratégico. Al no tener en claro hacia donde debe ir, se le hace difícil poder establecer un adecuado sistema de selección de personal, y por lo tanto, la elección del candidato adecuado para una posición. Como consejo, antes de iniciar una búsqueda laboral, o poner el acento en la cantidad de páginas que debería contener un CV, lo ideal sería contar con una buena arquitectura organizacional que permita "orientar" a las personas intervinientes sobre que buscar y fundamentalmente, para que. La selección de personal en las circunstancias anteriormente descriptas merece de un análisis, un debate profundo y muy profesional, no tan solo por una cuestión de costos. Hablamos de personas con sueños, ilusiones y necesidades, no de simples engranajes de una maquinaria generadora de productos y servicios.